This Bizarro cartoon is brought to you by a swarthy guy with poor hygiene and a penchant for argyle. Rorschach tests have been a favorite topic of cartoonists for a long time – few subjects are more fertile than the idea of "free association." Several months ago, I got to thinking about the concept of Rorschach's parents free-associating about him as an infant (decades before he invented his famous therapy technique, of course) but wasn't sure how to use it. This is one of those ideas that floated around my sketchbook for ages before I came upon a way to make it work. Like any artist (except really poor ones), I don't love all my ideas. But this is one I'm really happy with. The strange comments in the caption balloons resulting from my own free-assocation about infants, make me giggle. If I can make myself smile, it's usually a good sign. Oh Dan, you've outdone yourself on this one. Phenomenal job. This one is sublime. Now I get it! "Free Association". That's really good! Yeah, I looked at this one too and thought, "If I thought of this, I would be pleased with myself for hours." 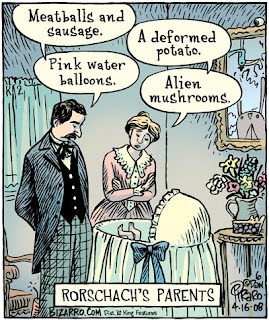 This is one of my fav Bizarros. a deformed potato...haha, love that one.